Chorus fungicide, available from Syngenta , provides a good start to Blossom Blight and Brown Rot control programme, when applied as part of an integrated disease management programme in Stone Fruit. 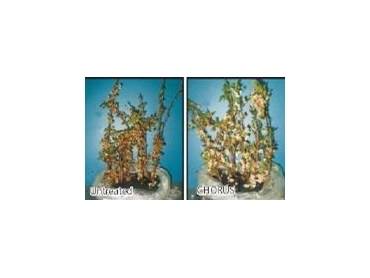 Chorus contains cyprodinil, a member of the Group I or anilinopyrimadine fungicides. Chorus has an ideal mode of action compared with fungicides currently registered in stone fruit. Chorus stops the fungus at two sites. It prevents penetration of the fungus into the plant and prevents growth of the fungus within the plant. Chorus rapidly penetrates leaf and flowers to give control of the disease from within the crop. Because of its rapid penetration into the crop, it is rain fast within 2 hours. In addition Chorus shows good persistence on leaf surfaces. This property makes Chorus a good product with long lasting protective activity. An example of a possible Blossom Blight and Brown Rot control programme follows below. The optimal control programme will vary between stone fruit varieties, regions and seasons. Chorus is registered in the following Stone Fruit; Apricots, peaches, plums and nectarines. Chorus should be used as part of an integrated disease management programme containing fungicides from alternative chemical groups such as Tilt and Bravo Weatherstik. Apply a maximum of three applications of Chorus between early blossom and shuck fall at a rate of 40g/100L. Critical application timings during this period are early blossom, late blossom and shuck fall. There is no need to add a wetting agent. After shuck fall, continue with a disease management programme using alternative chemistry, such as Tilt. Maintaining good hygiene in the orchard, with the removal of diseased twigs and fruit, and in the packing shed, will aid in the management of the disease. Chorus is a water dispersible granule (WG) fungicide, which mixes readily with water. Partly fill the spray tank with water. Start the agitation and add the correct amount of product to the spray tank with the agitation system running. Chorus is rated as being harmless to beneficial insects such as earthworms, predatory mites, lady birds, parasitic wasps and predatory bugs and practically non-toxic to birds and bees. Restraints: The effect of Chorus could be diminished if rain falls within 2 hours of application.